All five teams were engaged in league fixtures last week. In the top division, Prefects faced a difficult match against “Up4it”. Although the former are only two places behind the latter, there is a large gap in points between the teams. Star player Michael Hahn (Prefects) still managed to win two matches and lose one against Paul Montieth in the decider. In the process he defeated Gillian Edwards, an impressive achievement given she is currently the third best player in the league. Unfortunately, Up4it were up for it and comfortably took the remaining 8 points. New Kids were up against Division 2 leaders Villa at home. Ian McLagan won his first two singles for Villa but Howard Lee and Ian Smith kept New Kids in the race with fine victories against James Pickles and Sandy Bertie. For the Kids, Ken Falconer was discombobulated when his rubber detached itself from the blade during a rally. Thankfully Ian McLagan provided some glue to patch up the bat. Villa strolled into a 5-2 lead before Howard reduced the arrears but that was too little too late as Villa seized the last two points to claim a 7-3 victory. Calling on reserve Chris Wroniecki, Swots were away at the Forthill Club to play Sputniks. The Swots immediately took control of the fixture with a strong 3-0 lead. Sputniks fought back for the rest of the night but couldn’t quite recover from the early surge from Swots. In the end they reduced the deficit to two points, but Swots secured a 6-4 victory, with strong performances from Collin Bleak with a singles hat trick and from Chris with two wins. The last match in second division was played at Lundin Links were the Lasers were hoping to ambush Truants. The guests had other ideas, thanks to a strong display by Graham Wood, undefeated in singles and the doubles (aided by Alain Léger) and an additional point scored by Knut Radmer. Truants held the draw amidst controversy, after one player from the hosting team forfeited the match due to unsporting behaviour. In fairness Lasers were embarrassed by their own player and the teams parted in good spirit. Last but not least, Prospects had a great night at home against Squires in Division 3. Charlie Ross was undefeated on the night, while John Carlton and Ian Brumwell both recorded two solid wins each. Squires narrowly avoided a whitewash as the Dundee side earned two points in thrilling five setters which could have easily gone the other way. 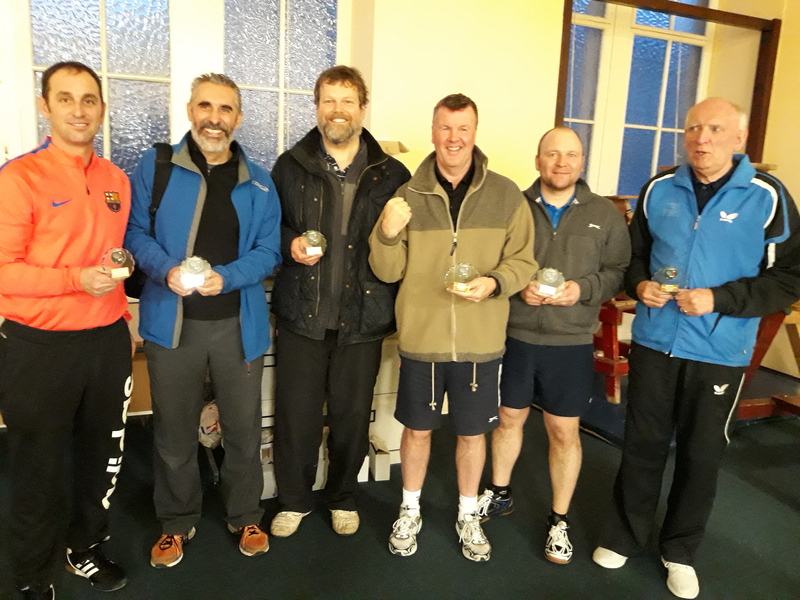 This entry was posted in Match reports, St Andrews Table Tennis Club on February 6, 2019 by standrewstt. With a number of injured players, it was a challenge for the club to field five teams of three players last week. In Division 1, the Prefects experienced another 7-3 defeat in a home fixture against Star. Normally they would have expected to perform better against opponents flirting with relegation. But with a team weakened through absence, the Prefects relied on stellar player Michael Hahn to win his three singles and avoid a whitewash. New Kids in Division 2 playing against Kingsway at Dundee’s fire station depended heavily on reserve player, Elaine Forbes. Showing her class, Elaine was on fire as she secured a very comfortable hat trick. Ken Falconer and Ian Smith both won one match each to scrape a 5-5 draw overall. Swots also had a difficult night at home against Lundin Lasers despite a splendid hat trick for Nick Shepherd. He was helped by Dave Beveridge in the doubles and a singles victory. Swots fielded a reserve player, John Carlton, but the Lasers were too experienced for him despite some very close games. Truants managed to field three of their own players against Tigers at home. It was a very long night with six five setters and some very long rallies. Truants tamed their opponents in the first four singles; Tigers rallied and roared back, but too little too late as Truants closed in with a 6-4 victory. Graham Wood had a good night with a hat trick, complemented by two wins by Alain Léger and one by Knut Radmer. In Division 3, the Prospects were up against a strong Comets team away at Forthill in Broughty Ferry. Despite a good win for Chris Wroniecki in the opening match, Comets were too strong and grabbed all nine remaining points. Finally, the club was well represented at the lower divisions (Divisions 2 and 3) individuals’ championships at the Ward Road gym in Dundee. Howard Lee reached the final of the over-25s, frustratingly losing by the narrowest of margins in the deciding game against Ian McLagan. Dave Beveridge also had a good run in the Fowler cup but lost to Andrew Nimmo in the semi-final. This entry was posted in Match reports, St Andrews Table Tennis Club on January 30, 2019 by standrewstt. Last week’s report ended on a cliff-hanger on the deciding point of the final game of the Handicap cup first round match between Up4it and New Kids. At 25-25, the outcome of the fixture is decided by sudden death, whoever wins the point wins the game, and in this case the match as well. Kong Wan for the New Kids was facing Ryan Docherty. Kong was king as he showed nerves of steel to conquer Ryan and qualify the Kids for the next round of the competition. In Division 3, Prospects enjoyed a splendid win at home against Missiles. Chris Wroniecki and Charlie Ross recorded hat tricks and claimed victory in the doubles match together while Ian Brumwell won two out of three. On the other side of the Victory Memorial Hall, New Kids were ready for the derby against Truants. Truants had a good start with Alain Léger and Knut Radmer taking the first two available points against Ken Falconer and Howard Lee. However, the home team took seven of the remaining eight points to seal a well-deserved 7-3 victory. The man of the match was clearly Knut having defeated Howard and Ian Smith in straight sets. Graham Wood, not having his best night, was the only player not to score a point in the match. Meanwhile Swots were away at Forthill against Tigers. After the first six singles, both teams were neck and neck on 3 points; Nick Shepherd and Collin Bleak then picked up a win in the doubles to put Swots in front for the first time on the night. Tigers roared back to clinch match by winning all three remaining singles in deciding sets. Swots will be disappointed to let victory slip away 6-4. Finally, Prefects were making the arduous journey to Brechin. Michael Hahn took the first match against Aaron Robertson, but the home team secured victory winning the next seven. In a damage limitation exercise, Michael and Bonifac Legrady grabbed the last two matches by a small margin in the deciding sets but the long journey back to Fife would have been even longer discussing the 7-3 defeat. This entry was posted in Match reports, St Andrews Table Tennis Club on January 23, 2019 by standrewstt. A happy new year to all readers of the blog. Wishing you a smashing time at the table! With the first half of the season completed, it is time to take stock and find out how the St Andrews teams are doing in their respective divisions. Starting in the lower league, Prospects are currently holding 4th place in a pool of 11 teams dominated by Tass from the Telecoms club. Given that there are 6 teams close behind them (within 12 points), and the gap to bridge to the third place is 13 points, Prospects will need to battle hard to maintain the status quo. In Division 2, the three teams representing St Andrews (Swots 4th, New Kids 5th and Truants 6th) occupy the middle of the table and are within three points of each other, but there also three other teams breathing down their necks within a handful of points. It is also worth mentioning that all three teams reached the semi-final of the Secondary Shield in December, with Swots very narrowly missing out on bringing the trophy back to St Andrews after losing 5-4 to the division leaders in the final. Finally, in the top division Prefects are comfortably in 5th place out of 10 teams. Unlike in the other two divisions, teams are spread quite far apart, and the order is less likely to change if Prefects maintain their standards. In other news, Truants and New Kids were engaged in the Handicap cup last week. The former were up against third division Missiles, but couldn’t overcome the handicaps assigned to them and lost comfortably 10-4. The latter however, faced Up4it, currently second in Division 1. Enjoying favourable handicaps, New Kids got off to a flying start, claiming five of the first six points available. The next two encounters saw the games split evenly, leaving the Kids three points away from victory at 7-3. Ryan Docherty and Gillian Edwards put up an impressive display of fortitude to level the match by claiming the next four points, and when Ian Smith and Paul Monteith shared the spoils in the penultimate match, it was all down to Kong Wan and Ryan Docherty to decide the outcome of the fixture. Kong drew first blood but Ryan was up for it and levelled at 9-9, forcing a game and match decider. Even this final set went down to the wire as it was decided in the last possible rally by sudden death at 25-25. This entry was posted in Match reports, St Andrews Table Tennis Club on January 17, 2019 by standrewstt.